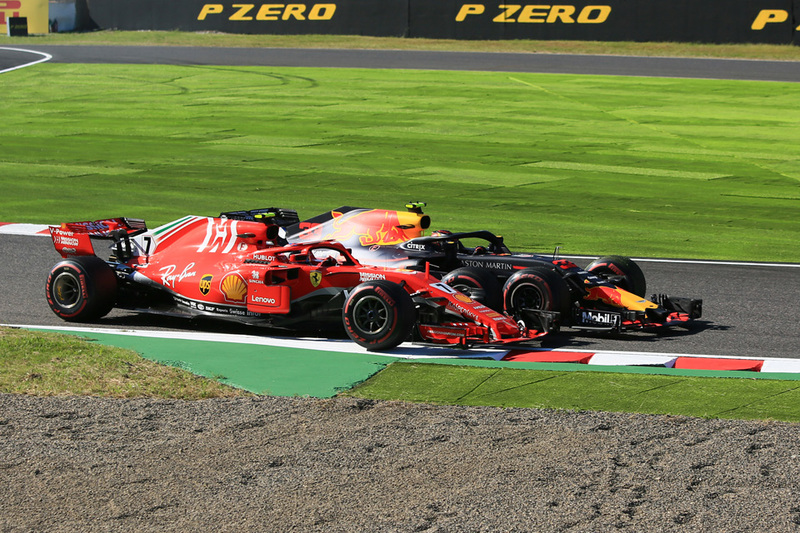 "You wouldn't want to get in the way of the World Championship battle, would you?," asked David Coulthard of Max Verstappen after qualifying. The Dutchman's reply was typically pointed. "Is it still a battle? Not sure." Formula 1 is a lot like US presidential nomination races. While that may seem an unlikely analogy in either pursuit 'The Big Mo' - the intangible called momentum - counts for a lot. In either pursuit too such runaway handcart scenarios can be felt in the positive or the negative. We're seeing both in F1 right now. The theme of recent weeks scarcely altered in Japan. If there was a shift it was only to gather pace in the direction it was already headed. Lewis Hamilton won from pole, barely looking troubled as he did so at this Suzuka track that perhaps suits the Mercedes better than any other. While Ferrari's momentum in the negative also accelerated. It was perhaps further off the Merc pace than previously. And again Ferrari when up against it made things worse with acts of self-sabotage. This time it entered the realms of farce. Late in qualifying it sent both cars out on intermediate tyres - rain was expected at some point but in that moment the track was bone dry. The sight of the two cars crawling around the lap on utterly unsuited rubber was risible. 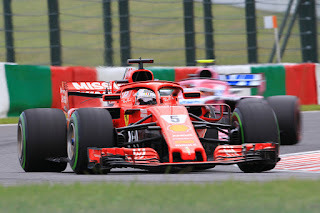 Then by the time the red pair got to try their qualifying laps properly after switching back to dries Kimi Raikkonen and Vettel both made errors. Then the rain arrived. Raikkonen therefore started fourth and Vettel a desperate eighth. If one is to be generous it reflected a team that realised it needed the grandest of long shots to come in to rekindle its faint title chance. More likely it reflects the generally scrambled thinking of late at the Scuderia. Boss Maurizio Arrivabene's subsequent comments lent weight to the latter theory. So did its strange race strategy given to Raikkonen. In another echo of the previous round in Russia it did look for a time that Vettel might salvage something in the race despite it all. He shot up to fourth place on the first lap then a safety car ensured the Mercedes pair hadn't escaped. But like in Russia his hope was fleeting as shortly afterwards he made contact with Verstappen's Red Bull and spun having sought a risky pass, and so dropped to the back. It's rather chicken and egg, but Vettel and team have lately been reflecting each another in their over-reaching. And again it reflects that thing called momentum. The more Ferrari and Vettel have lost ground to Mercedes and Hamilton in the table the more driver and team have seemed desperate to wrest the deficit back in a heroic single bound which ends up, predictably, backfiring. Perhaps we can trace it to Vettel binning it at Hockenheim. That's certainly, coincidentally or not, when Hamilton's devastating run of six wins from seven commenced. Hamilton's table lead is now 67 points with just 100 available. 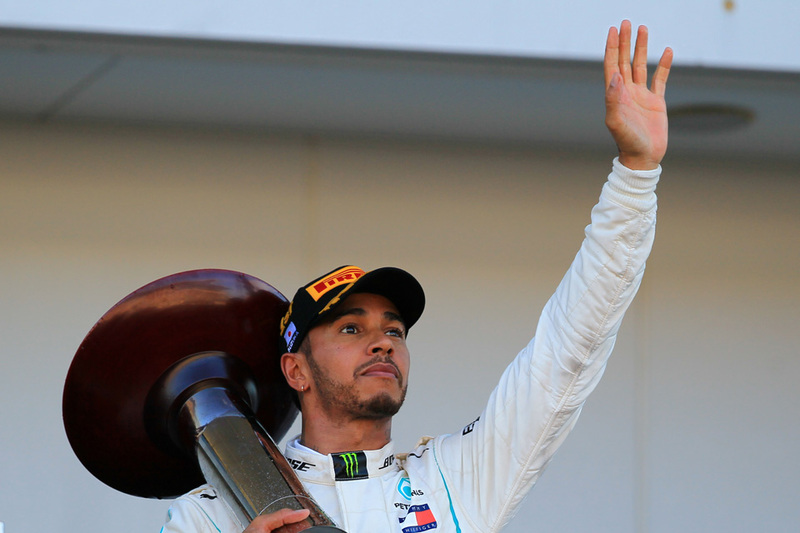 Another result of the sort we've been getting lately and the title will be his officially in the next round at Austin - and Hamilton tends to be untouchable in Texas. This one is over. Vettel after his clash, in another continuing theme, creamed the Class B cars easily and got back to sixth place. Then came the final Ferrari white flag - late on it elected not to take the extra points available from swapping him with Raikkonen ahead. Ferrari seems to realise it's over too. It was only just over a month ago, around Spa-Monza time, that we thought there was no way Ferrari could lose. Hamilton meanwhile hasn't always been happy here - he only got his first Suzuka pole last season. But in his most recent couple of visits he at last appears to have discovered his local equilibrium. Mercedes as noted was well on top in this one - this is just the sort of track that suits it. And of the two in silver Hamilton was well ahead. As early as Friday practice he was crowing in his cockpit - demonstrating a man who knew this one was in the bag barring the very unforeseen. Even so Hamilton seemed to regret Ferrari exiting the championship party earlier than anticipated. "When we were having a race like Monza, for me I loved that and I would have been happy to have that every race," he said afterwards. "I honestly thought that was how it was going to be given how they were so strong in the previous two races. "But they have lost a lot of performance and then it has been a little bit difficult for them. I would love to have a race right to the end. But I can't let that take away from the great job we're doing and our happiness." 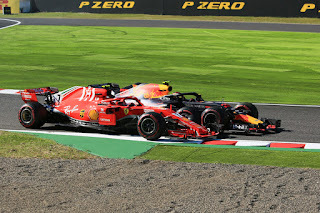 Perhaps something else that underlined Ferrari's wastefulness this year is that for all Hamilton's imperiousness on points, only halfway through this race in Japan did he overtake Vettel on laps led in 2018. 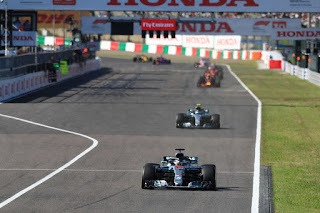 Hamilton's team-mate Valtteri Bottas followed Hamilton home at a distance in second, struggling with his tyres, while Verstappen conforming with another recent theme was mighty in chasing him home in third. His run was eventful too featuring clashes with both Ferraris - he likely was blameless in the Vettel incident but showed less judgement in a first lap run-in with Raikkonen which got him a five second penalty. The other Red Bull pilot Daniel Ricciardo also drove very well to come fourth, rising up after starting 15th due to his throttle actuator failing in qualifying. Raikkonen as intimated finished fifth, and rather distant after being compromised by damage in the Verstappen clash as well as by an early pitstop. Sergio Perez in the Force India got the best of the rest award in seventh. He'd not made the best of damp final qualifying but drove well in the race and in fine style ambushed Romain Grosjean's Haas - who had led the Class B fight on Saturday and Sunday up to that point - for the place late on at the chicane right after a Virtual Safety Car period. Perez's team-mate Esteban Ocon finished on Grosjean's tail in ninth - doing what he could after losing three grid places for speeding under a red flag in final practice. 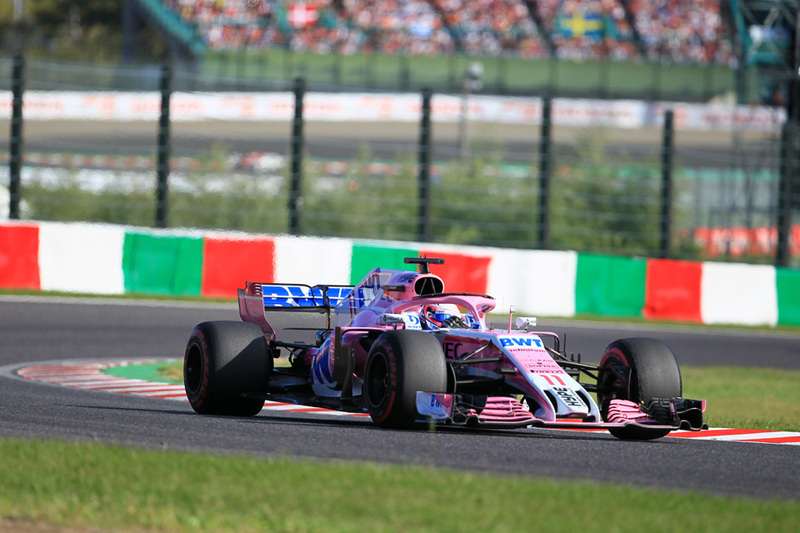 While Carlos Sainz was another to drive very well, in his case for the final point after passing Pierre Gasly's struggling Toro Rosso late on. As for what's doing at the front, with all the talk of continuing themes they may in fact stretch even further than we think. Go back 12 months to 2017 and then we also had a nip and tuck title battle between Hamilton and Vettel. Just like then from Singapore Vettel and Ferrari went to pieces and Hamilton found another level and took the honours ahead of time. The coincidence is even more disquieting. Now, after 17 rounds of the season, Hamilton has 331 points and Vettel 264. After 17 of 2017's rounds? Hamilton 331; Vettel 265. Ferrari it seems has demonstrated Karl Marx's aphorism. For the Italian squad history has repeated. First as tragedy; second as farce. How Does F1 Make Money?